Nineteen woodworking companies receive commendations for their excellent projects. Materials: Maple solid and anigre veneer with heavy figuring, Corian Antarctic solid surface material, Lumacast polymer panels with Asian grass design, aluminum slatwall, Nevamar and Abet Laminati laminates, Blum hinges, Accuride slides, Timberline locks and HÃÆÃÂ¤fele Hawa pocket door system and door pulls. Project Details: The design concept was based upon the soft curves, forms and lines reflective of the body in motion. As a result, there is not a straight line anywhere, and the woodwork had to be manufactured in a cone-shaped pattern that constantly varied, says Mark Bernhard, president. "Allof the veneer leaves had to be clipped individually in order to create the veneer skins, because no piece had a constant radius," he adds. Materials: Cherry, rosewood and maple burl were used for the casework, along with frosted glass, 1- to 2-inch-thick glass and a roll-up television screen. Project Details: The room is rectangular with a hint of exposed beam construction, and the client wanted to soften the room with rounded cabinetry. The resulting TV unit, bar and display cabinetry turned an otherwise unusable space into a much-used lounge, says Robert Schultz, owner/president. Materials: Block mottled makore and pommele sapele veneers laminated onto MDF sheets, as well as solid Honduras mahogany. Project Details: The makore and sapele-veneered panels were assembled with a Z-clip system to help create a 36-foot-high montage of different woods, says Richard Wilson Jr., president. The 62-foot elliptical bar adds to the themes of wood, stainless steel and opaque glass. Materials: Sequenced-matched and numbered plain-sliced maple veneers were used for the curved wet bar, island and back bar unit. Maple was also used for the fascia for the fireplace, flat-screen TV and A/V rack unit. Project Details: Vice President Anna Maria Vona says that the cabinetry and furniture in the entertainment suite are unusual because "they are futuristic yet still retain a warm ambience." The granite tops have a reverse bullnose edge, and the bar sink is completely carved from maple panels. Project Details: There are several hidden features in the library, such as a TV that lifts out of the floor and a projector that comes out over the door, in this octagon-shaped room. All the carvings were done by hand, says Bob Crutcher. Several coats of a hand-rubbed oil/varnish and wax mixture were also applied. Materials: The tabletop and base are walnut burl from Certainly Wood. The arms are finished with a spray-applied bronze "veneer" from Plate-All Mfg. "It allowed us to create a look at a fraction of the expense of solid bronze," says Andrew Jacobson, president. 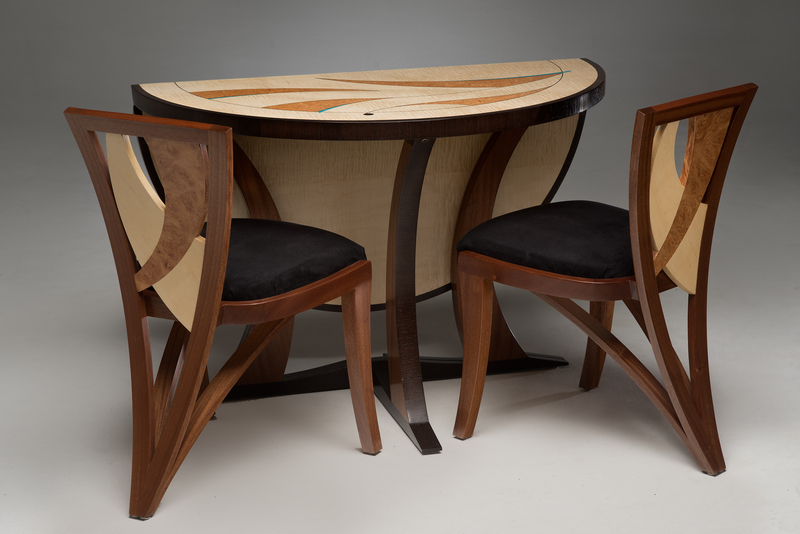 Project Details: The arms of the table were made with tapered bent lamination, pressed in a Vacuum Pressing Systems press. They were tenoned into the cylindrical base using a JDS multirouter. The pieces connecting the tabletop to the arms are HÃÂ¤fele door pulls that were cut in half. Materials: Sixteen 8-foot-long 8/4 black walnut planks were used to build the plank-on-plank top. Project Details: The table is 14 feet long and 5 feet wide. Michael Doerr balanced the individual planks and studied the grain, placing sapwood next to sapwood and heartwood next to heartwood. As a result, the tap stays flat and has a light sapwood in the middle surrounded by the dark heartwood. The tapered apron and the horizontal stretcher running the length of the table gave the piece a light, elegant appearance. 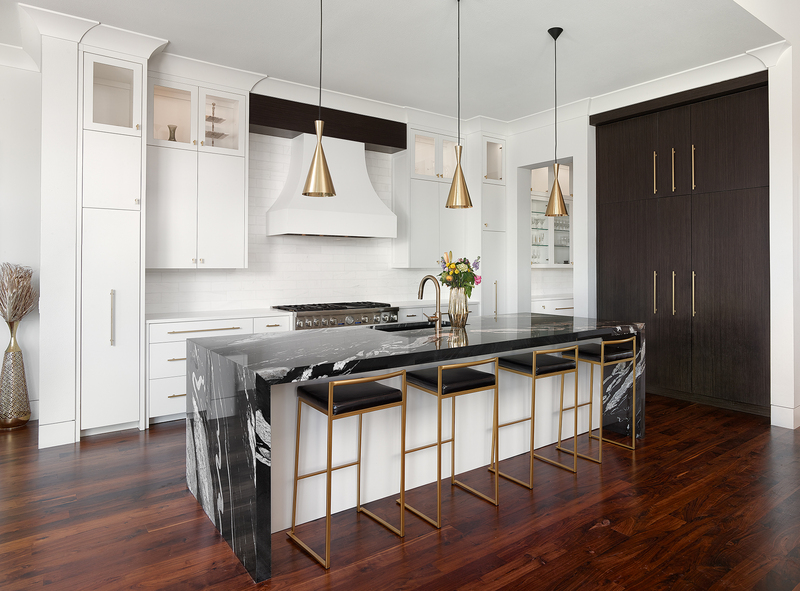 Materials: The bar cabinetry is solid African ribbon-striped mahogany from Shiels Lumber, and the custom 1ÃÂ¢?Ãâ2-inch-thick tiger maple curved panels were fabricated by Sieling and Jones. Project Details: The project was designed by Ligo Architects of Slippery Rock, PA. Greenville used an SCMI shaper and Williams and Hussey moulder for the curved bar rail. Mahogany boards that were 20 inches thick were cut for the curved trim, which looks like a seamless piece of wood in the finished profile, says Vern Swartz, owner. Project Details: The library is 20 feet by 20 feet with 14-foot-high ceilings. The fireplace wall had four doors that appear to lead into another room but are actually large cabinet doors. One side holds a bookcase, and the other holds a plasma TV on an articulating arm, says Rocco Dolfi, secretary/treasurer. Materials: Except for the decorative veneers, the chiffonier is constructed entirely of mahogany. Project Details: The marquetry on the piece shows an entrance to a wine estate with a wrought-iron door and fence and a grape vine growing over it. The inside doors are also decorated with wine themes. 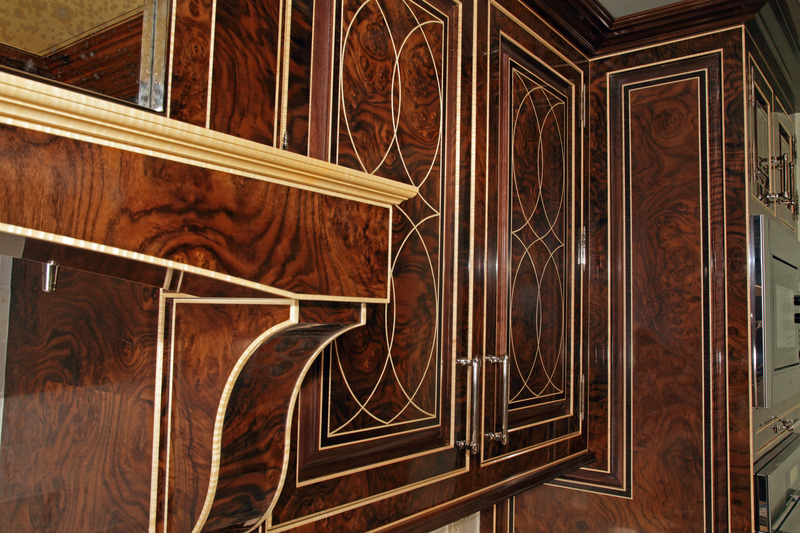 The marquetry was inspired from majestic wine estates in the Cape region of South Africa, which was settled by French Huguenots in the late 1600s. Materials: Figured anigre and bubinga veneers from Certainly Wood, bubinga, alder and wenge lumber from A&M Wood Specialty. Project Details: The undulating curves in the bed, bench and dresser/armoire are produced by laminating layers of veneer (as many as 16 layers) over a form in a Vacuum Pressing Systems press. The cases and drawers are all dovetailed, and the other joinery is mortise and tenon, says Steve Holman, owner. Materials: The dome consists of 73 parts plus fasteners. The foundation was made of plywood spirals from Bahama Ply, and the skins are Chinese 4-inch birch ply. Four stress-skin panels of lauan plywood made a 10-foot by 13-foot projection screen. Project Details: The first show installed in the room was Bubbles, an interactive musical experience. The dome is adaptable for other installations as well. "The space it encloses is warm and comforting," says Jim Lewis. "Just what is needed to give people the confidence to unwind and play with a computer installation." Materials: Wilsonart laminate was used for the pedestal and base in black and brushed metal. The clock head is spun aluminum. Both clock head and pedestal are illuminated with electric lights. Project Details: The clock stands more than 6 feet tall, and the sculptured light tunnels display thousands of light reflections that appear to descend into infinity, says Douglas Durkee, owner. The support saddle is MDF laminated with the Wilsonart laminate. It has a dovetail joint so that the clock cradle can be slipped off of the pedestal in order to service the lamps in the pedestal. Project: Garden Restaurant hostess station at the Art Institute of Chicago. Materials: Pommele Sapele veneer and makore solids. The cast iron copper-plated railing baluster was a reclaimed piece designed by Chicago architect Louis Sullivan in 1899. The balusters are part of the museum's architecture collection. Project Details: The station, designed by Ira Keer and fabricated by Alpha-M Woodproducts Inc., is a modern composition of vertical and horizontal planes forming a base, middle and top. "This creates a uniquely simple backdrop to Sullivan's magnificent ornament, which transforms the millwork from something commonplace to a welcoming work of art," says Keer. Materials: The outer shell is constructed of reclaimed redwood from an old pickle vat from Duluth Timbers. The inside is bent laminated Baltic birch ply with fiddleback black ash veneer from Certainly Woods. Project Details: "When I designed this piece, I knew that it would be challenging to build," says Martin. "What I did not realize in the beginning is that I would come to call this piece "Nemesis." The cabinet stands nearly 6-1/2 feet tall, and nearly everything is curved. The shelves and drawers are the only straight lines, but the drawer faces continue the curved design. Materials: The full-log stringers are made of laminated pine with hand-carved treads of pine and spruce. The Ballustrade is hand-forged iron. Project Details: The log stringers that twist as they turn are made by laminating full logs that have been milled into thin full-length pieces that are then glued around massive forms. "There's no obvious appearance of being 'manufactured,'" says Kimberly Horning, co-owner. Materials: The buffets use quarter-sawn white oak and veneered plywood from Formwood Industries. Hardware was supplied by Martin & Co. Hardware. Project Details: The piece is set in an Arts and Crafts style, says Timothy Sutherland. The white oak was hand selected, planed on a Yates 30-inch planer and palm sanded with Dynabrade sanders. The multi-step finishing process included brushing in color and letting it rest on the wood for up to 30 minutes before gently wiping it off again. A layer of Magnalac Dull Finish was applied, sanded down and repeated until sanding was no longer required. Materials: Mahogany, cherry, poplar and mappa burl were used in the piece, as was HÃÂ¤fele hardware and Accuride pullouts. Project Details: A complete functioning office is tucked away in this 95-inch by 45-inch by 4-inch by 26-1/2-inch credenza, says Jerry Whittington, president/owner. It holds a computer monitor, CPU, keyboard, mouse pad, fax/printer/scanner pullouts, two storage drawers, two file drawers, disc rack pullouts and storage space. The base was built extremely rigid to support not only the granite top but also a possible bookcase top addition. Materials: Materials used include American black walnut, walnut burl, curly maple, flat cut maple, steamed beech and hardwood veneer core plywood. Project Details: The table base is hollow and was constructed by gluing 14 walnut sections around the circumference. Each section is 61-1/4 inches wide tapering to 41-1/2 inches wide at the top. Dennis Zongker, president, hand-carved acanthus leaf clusters and flower buds around the lower section. The hollow base contains a time capsule with company information and a complete diary of the table's construction. The marquetry on the tabletop is original artwork.